Perth may be the most isolated capital city in the world, but that doesn’t mean that Western Aussies miss out on the huge possibilities that the rest of the nation get to share in lottery prizes. WA is part of many of the same national lottery networks hosted by the Tatts Group, but runs independently under its own organisation, Lotterywest, which also hosts some state lotteries exclusively for Western Australian residents. We’ll take you through all the lotteries available for WA players and a little more about the organisation that hosts them. Lotterywest is the Western Australian body responsible for operating the Australian national lotteries in WA. The organisation not only distributes national lottery tickets to WA residents but also uses funds to support the local community, donating many of its profits to state and government run charities and organisations. Cash 3 – Cash 3 is Western Australia’s own lottery and is not available elsewhere around Australia. Cash 3 lotto is drawn every single night, 365 days a year, giving WA players the chance to win up to $500 every night of the week. There are three separate sets of numbers between zero and nine and three numbers are drawn from each set. Wins can be made up of numbers appearing in exact order, any order or both ways. The odds of Cash 3 are pretty decent as far as the lottery goes, with the odds of placing an exact order win one in 1,000. This kind of lotto game format is also used in several locations in the USA. Oz Lotto – Oz Lotto was Australia’s first fully national lottery game and to this day it holds the record for the biggest ever jackpot win in Australian lottery history after $111 million was won in 2012. Oz Lotto carries seven prize divisions with a minimum prize pool of $2 million. The results are drawn every Tuesday night. Monday, Wednesday & Saturday Lotto – these national lotteries are syndicated to all Australian states and territories, with multiple draws throughout the week meaning you never have to wait long for your chance to strike it rich. Each game consists of six numbers and two supplementary numbers being drawn from a barrel of 45 balls to determine the winning numbers. Monday, Wednesday and Saturday lotto’s each come with six major prize divisions. Powerball – Powerball is available to players from all Australian states and territories, carrying some of the highest available jackpots. The Powerball draw happens every Thursday night, with six winning balls drawn from the first barrel to determine the winning numbers, plus one additional ball drawn from a separate barrel to become the Powerball. Powerball has been responsible for some mammoth wins around Australian, with one lucky WA resident scooping up a cool $50 million in July 2015. 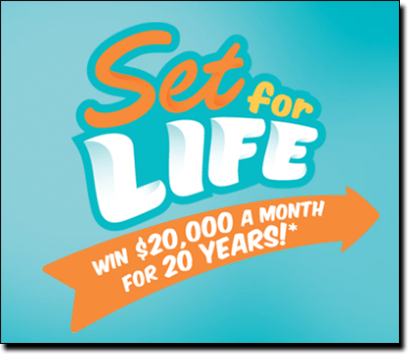 Set for Life – Instead of winning a giant lump sum, winning Set for Life gives you the chance to win $20K paid out monthly for 20 years, a prize that’s guaranteed for up to four winners. Set for Life comes with seven day entries, with a draw happening every day of the week. You’ll need all eight winning numbers for the ongoing $20K prize, but there are also several smaller prize levels available. Soccer Pools – available nationally, the winning numbers from the Soccer Pools lotto are determined by actual results of real soccer matches. Each week there’s a list of 38 soccer matches and players choose who they think the six teams with the highest scores will be, as the results determine the winning lotto numbers. The seventh highest scoring game becomes the Soccer Pool supplementary number. This is a great game for sports lovers, combining real soccer with the thrill of the lottery. Super 66 – Super 66 is played in all states including WA, excluding only NSW. The game is drawn every Saturday night just before the results of the main Saturday Lotto and is a kind of add-on game to the main draw, bringing the chance to win up to $1 million. Players choose six numbers from zero to nine, hoping to match them in the exact order drawn from left to right on the lotto ticket. Scratch ‘n Win – Lotterywest provides a range of Scratch’n’Win games, giving players the chance to win instantly by purchasing scratch cards at a range of WA retail outlets. Scratchies range from $1 tickets to $20 tickets, with each card syndicate offering different prizes and odds. If you’re looking for a way to enter more lotto draws with less damage to your bank account, consider becoming part of a lottery syndicate. A lottery syndicate is where a group of individuals pool their money in order to buy more lottery tickets for a more affordable price, then splitting any winnings if they occur. Lottery syndicates are very popular amongst Western Australian residents hoping for that big lotto win without having to fork over as much of their own cash. Lotterywest is owned by the Western Australian government and has been in operation since 1932. The aim of the organisation has always been to benefit the entire WA community, which it has successfully continued to do to this day. Lotterywest not only gives Western Australian residents the chance to win huge life changing amounts of money, but also uses profits raised from ticket sales to directly benefit the state. From 2015 onwards, Lotterywest is looking to implement new retail designs and technologies, giving players an enhanced lottery experience both in store, online and over mobile. Western Australian residents can participate in lottery games online by purchasing tickets to Australian and international lottery draws at Lottoland and OzLotteries.